The cold and hot bucket set 3PCS 10.. The cold and hot bucket set 3PCS 10L 0.85L 0.8L Features Resistant to temperature ..
Deluxe Set Products To Create a Bet..
Deluxe Set Products To Create a Better Life 18 PCS SET Package includes 1x Insulated ..
Lightweight & Collapsible Chill Che..
Lightweight & Collapsible Chill Chest Cooler of 39L Extra Large Capacity 60 Cans (L60 x .. Plastic Water Cooler Sets- 3 Tempra.. Plastic Water Cooler Sets- 3 Temprature Resistant Coolers (8L, 3L, 1L) Features Resis.. Stainless Steel High Grade Vacuum F.. Stainless Steel High Grade Vacuum Flask Hot Cold Drink Insulated Thermos of Capacity 0.5L ..
Potluck JN360 Insulated Food Flask ..
Potluck JN360 Insulated Food Flask Thermal Lunch Box With Stainless Liner 3.6L Specification ..
2 in 1 Ice Cooler Hard Chest Box Tr..
2 in 1 Ice Cooler Hard Chest Box Travel Picnic Lunch Box Portable Carry Handle (L : 20L - M:10L) .. Liquid Bucket Set Of 4 Pcs, Thermal.. Liquid Bucket Set Of 4 Pcs, Thermal Insulation Keep Cold Bucket (11.5L, 5.7L, 2.2L, 1L) Speci..
Hello Kitty Heated Mini Water Dispe..
Hello Kitty Heated Mini Water Dispenser Serves Up 8 Glasses Of Water - Red Cute desi.. US Military Water Bottle Canteen - .. US Military Water Bottle Canteen - Jungle Camouflage Features: Capacity: 1L Out.. The Cold and Hot Bucket Set of 6 PC.. 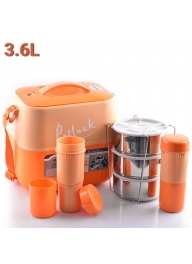 The Cold and Hot Bucket Set of 6 PCS 6L Features Resistant to temperature Light..
26L Ice Cooler Hard Chest Box Trave..
26L Ice Cooler Hard Chest Box Travel Picnic Lunch Box Portable Carry Handle Be..
AOTU AT6632 10L Collapsible Water S..
AOTU AT6632 10L Collapsible Water Storage Folding Water Bottle Foldable PE bucket Made of..
Familly Canteen Set of 4 pcs (12L, ..
Familly Canteen Set of 4 pcs (12L, 6L, 2L, 0.75L) Specification Resistant to temperat..
6 x 2 L HL Happy Lion Two Beverage ..
6 x 2 L HL Happy Lion Two Beverage Portable Hot & Cold Water Jug Was..
Hello Kitty Heated Mini Water Dispenser Serves Up 8 Glasses Of Water - Pink Cute des.. Stainless Steel Vacuum Flask Hot Co.. Stainless Steel Vacuum Flask Hot Cold Drink Insulated Thermos of Capacity 2L Lever action.. Stainless Steel Vacuum Flask Hot or.. Stainless Steel Vacuum Flask Hot or Cold Drink Insulated Thermos of Capacity 2L An attrac.. Intelligent Wireless & RechargeablePump Electric Drinking Water Pump Universal Gallons Water ..